Sit back and embrace Ramsgate’s cosmopolitan café culture. Set in the Garden of England, Ramsgate and its neighbouring towns and villages in East Kent offer a wide choice of restaurants. Relax in one of the sea-facing cafés or restaurants, watching the boats come and go in the marina and admiring the skies that J.M.W Turner described as the loveliest in all of Europe. It is difficult not to have a sea view when you are sitting anywhere in the Townleys dining room. Whether it be a view over the harbour or down towards the beach, if you want to see the sea, you have chosen the right eatery. With an abundance of seafood making its way into Ramsgate Harbour courtesy of Fruits de Mer in Broadstairs, you will be able to delight in locally caught fresh fish. For breakfast, a light lunch or a quick bite, try Caboose in Ramsgate, with its menu of homemade dishes – the full English, sandwiches, burgers, frittata, salad, soup, or Miles Bar on the seafront. The Greedy Cow in Margate Old Town is delightful, as is the bohemian Harbour Bar Café, or Peen’s and Samworth & Mee in Broadstairs. What is a trip to the British seaside without a fish and chips experience? Peter’s Fish Factory on the seafront, just a few minutes walk away, is a local favourite. If you fancy seafood on the go, try Mannings on Margate seafront by the Turner Contemporary. You could even grab a delicious crab sandwich and enjoy it on the Margate Steps that lead down to the sea. The beauty of food on the go at the seaside is the opportunity it affords to sit and eat whilst staring out to sea. Listen to the waves and work it off with a brisk walk along Ramsgate sands. If you’re happy to venture our of Thanet, then you’ll find some great places to eat not far away. The best are the Michelin-starred The Sportsman in Seasalter. In nearby Whitsable is Wheelers Oyster Bar, with its seafood bar and restaurant. Jojo’s and East Coast Dining Room in Tankerton, and Le Petit Poisson in Herne Bay are all worth the short train or car journey. Going west are Mark Sargeant’s Rocksalt in Folkestone and the Marquis at Alkham. Local producers and specialist food and drink suppliers can also be found congregating under the roofs of the Goods Shed in Canterbury and McKnades in Faversham. For many this is an opportunity to wander, gaze and get hungry. The freshest produce East Kent has to offer in two significant food and drink epicentres. Ice cream or gelato by the sea is a must in Thanet, with its 1950’s ice cream parlours. Sorbetto in Ramsgate, and Morelli’s and Chiappini’s in Broadstairs all retain their 50’s décor and traditional Italian gelato recipes. 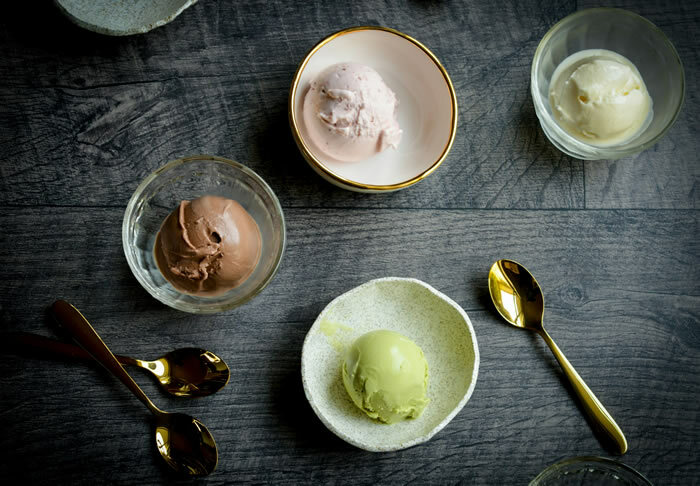 Newly established is Melt in Margate, creating classic gelato in a cool, contemporary environment. In Ramsgate, take afternoon tea at the Harbour Chocolate Lounge under the arches in Ramsgate, or at Corby’s Tea Rooms. The Cupcake Café is a popular stop in Margate, as is the off-the-wall Madhatter’s Tea Room.